MESRA: Taib, Ragad, Mawan dan pemimpin SPDP bersalaman dengan para perwakilan dan penyokong pada Perhimpunan Agung Tahunan SPDP Ke-8 di Dewan Suarah Bintulu semalam. In July of 1975 I went to Portugal because in April of the previous year a bloodless military coup had brought down the US-supported 48-year fascist regime of Portugal, the world's only remaining colonial power. This was followed by a program centered on nationalization of major industries, workers control, a minimum wage, land reform, and other progressive measures. Military officers in a Western nation who spoke like socialists was science fiction to my American mind, but it had become a reality in Portugal. The center of Lisbon was crowded from morning till evening with people discussing the changes and putting up flyers on bulletin boards. The visual symbol of the Portuguese "revolution" had become the picture of a child sticking a rose into the muzzle of a rifle held by a friendly soldier, and I got caught up in demonstrations and parades featuring people, including myself, standing on tanks and throwing roses, with the crowds cheering the soldiers. It was pretty heady stuff, and I dearly wanted to believe, but I and most people I spoke to there had little doubt that the United States could not let such a breath of fresh air last very long. FEB 19 — How does one acclaim a man who is a living legend? Recognised by every Malaysian for his tireless advocacy for justice and freedom. Acknowledged by friend and foe as an indefatigable fighter for a better Malaysia. And admired universally for his unquestioned courage, incorruptibility and integrity. Shakespeare wrote that some are born great, some achieve greatness, and some have greatness thrust upon ‘em. I want to touch on Kit’s greatness that have been rarely explored, his ability to inspire others to scale heights and even attain greatness. Kit led both by example and also by empathy with those around him. A word or his mere presence sufficed. Somehow we who followed him were greatly comforted that he would be there for us to pick us up when we fall or to help us if we were in trouble. The affection and love party leaders and members have for him is genuine. 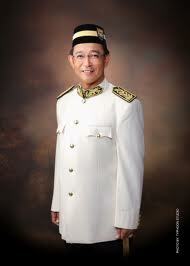 We may not agree always with him but we trust his judgment and idealism implicity. 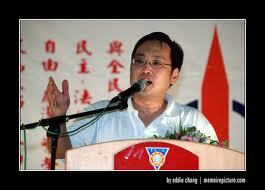 Many joined DAP because of Kit, those who did not stayed on in DAP also because of Kit. Our national chair Karpal would bristle at any slight on Kit and would express his anger at those who tried to denigrate Kit. 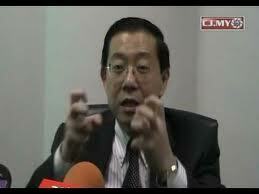 Our national adviser Dr Chen Man Hin always advised us to seek Kit’s counsel. Karpal never failed to remind me that what we achieved today is due to Kit’s leadership during those tough times and that we must never forget Kit’s historic role in helping DAP to win power. Of course, there were a few who fell by the wayside. Greatness is not easy to live with. After all, for one who had a difficult time growing up under a banyan tree, I can understand how some eyes can be dimmed when they fail to live up to the ideals. This is why we appreciate Kit more. With maturity we realise how important Kit helped in blazing the path, keeping the flame burning and lifting up flagging hopes whether in the best or worst of times. Most of all, Kit kept all of us in the right path. That we must not only do the right things but must do things right. Thank you Kit for inspiring DAP and us to greatness. Happy 70th birthday and may you be with us for many more years. The Bahraini regime cannot violently suppress its own people without the US support, a political expert says amid the escalation of pro-democracy protests in the Persian Gulf Arab state. “Bahrain is a country where the United States has an enormous military presence, so without a doubt the Bahraini regime cannot kill and slaughter its own people without knowing that they'll be supported and backed by Americans,” said Dr. Mohammad Marandi, a professor at Tehran University, in an interview with Press TV on Thursday. “The United States does not want change in any part of the Middle East; they've basically tied their foreign policy to Israel and all of these corrupt and despotic regimes…they've remained in power for decades due to the support of the United States,” he added. MUKAH: Ketua Menteri Pehin Sri Abdul Taib Mahmud mengingatkan pihak pembangkang yang kemaruk untuk berkuasa agar tidak membohongi rakyat. Jelasnya, pengalaman selama 30 tahun menduduki kerusi Ketua Menteri menjadikan beliau cukup matang untuk mengetahui sesiapa yang berbohong. “Saya klasifikasikan bohong kepada tiga jenis. Ada bohong bergurau. Ada yang berbohong untuk mendapat perhatian. Bohong ketiga paling bahaya iaitu bertujuan memecahbelahkan rakyat. “Pembangkang memang banyak berbohong kepada rakyat. Janji itu ini, konon kalau berkuasa akan menabur duit. Bukan mudah, sedangkan kerajaan tidak dapat melakukan sebegitu. Apa lagi mereka,” tegasnya. Menjelang pilihan raya umum ke-13 lalu, Menteri Penerangan Zainuddin Maidin menyifatkan pemblog sebagai penyanyi karaoke yang seronok dengan nyanyian mereka. Sebelumnya, mantan ketua pengarang Utusan Malaysia itu menyifatkan pemblog sebagai goblok dan pemblog terbabit hanya seronok menulis untuk bacaan satu sama lain. Seperti sesetengah pemimpin Barisan Nasional (BN) waktu itu, Zainuddin memandang ringan kuasa blog dan internet. Beliau masih menganggap bahawa media arus perdana tetap mempunyai kuasa mutlak kepada majoriti rakyat. Menurut beliau, keadaan blog semakin parah apabila disertai oleh golongan penipu, penulis upahan dan desperado yang menulis bukan kerana kebenaran, tetapi untuk kepentingan peribadi. Pada waktu itu, hampir tidak ada hari berlaku ahli politik dan pembesar negara mengecam, mengkritik dan mengutuk pemblog. “Mungkin ada golongan yang suka dengan nyanyian mereka, tetapi tidak kurang juga yang menolak kerana nyanyian itu disifatkan sebagai sumbang,” kata Ahli Parlimen Merbok itu. Apa yang terjadi kepada beliau, kita semua ketahui. Beliau tewas di tangan pembangkang dalam PRU-13. KUCHING -- An alleged planned protest against Sarawak Chief Minister Abdul Taib Mahmud did not take place at Padang Merdeka here today, police said. Padang Merdeka was quiet and peaceful, just like on any Sunday afternoon. Several tourists were spotted walking across the field while a few police MPVs were seen being driven around, apparently monitoring the area. 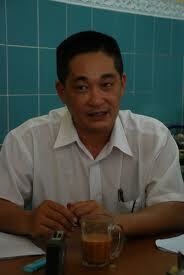 Kuching police chief ACP Mun Kock Keong said police monitored the area, but there was nothing unusual to report. "It was good when nobody showed up for the protest," he told Bernama. The Mubarak regime could collapse in the a face of a nationwide protest movement... What prospects for Egypt and the Arab World? "Dictators" do not dictate, they obey orders. This is true in Egypt, Tunisia and Algeria. SIBU: The Sarawak Barisan Nasional (BN) has never underestimated the ability of the opposition to win the general election, said Chief Minister Pehin Sri Abdul Taib Mahmud. He said the state BN had always made thorough preparations in facing the opposition onslaught in the election. 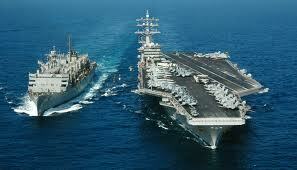 “We adopt the usual BN strategy. We have never underrated them (opposition),” he told reporters after laying the foundation stone for the RM46.6 million Sarawak Islamic Complex at Jalan Awang Ramli Amit here yesterday. A VALENTINE’S DAY FICTION Taib is facing the worst crisis of his life. It has nothing to do with his disagreement with the prime minister. It is not connected with the demands of his party-members who want his wholehearted attention towards the upcoming State elections. At first, many people thought he was still angry with his deputy, George. George was careless and allowed the media to find out that he had quietly married a younger woman. Taib was cross because he did not want people to think that he was imitating George. 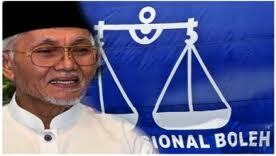 Nevertheless, Taib’s dilemma is nearer to home. He has been given an ultimatum by his new wife. Today, is Valentine’s day and he just feels too old for all that lovey-dovey stuff. After all, what do you give a girl who has everything. All of his state and parts of the world and the French Riviera are already hers. 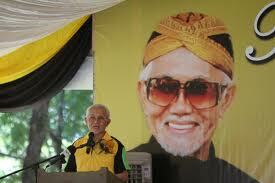 Taib did not forget the card, just in case people thought his declining years affected his memory. He does not have Alzheimer’s – at least not yet. BANTU: Talib (kanan) dan Pandi (dua kanan) menimba air di sebuah rumah apabila banjir mula surut. BINTULU: Kampung Asyakirin Fasa I dan II dilanda banjir kilat malam kelmarin, selepas hujan lebat bermula kira-kira jam 2 petang Selasa menyebabkan ada beberapa rumah ditenggelami air sedalam tiga kaki. Ketua Kampung Abu Bakar berkata, air mula naik dengan pantas kira-kira pada jam 7 malam. “Ada yang tidak sempat meletakkan perabot di tempat tinggi,” katanya ketika ditemui di lokasi kejadian. Naib Ketua Pemuda Parti Pesaka Bumiputera Bersatu (PBB) Pandi Suhaili berkata, lebih 20 rumah terjejas akibat kejadian yang jarang berlaku. “Jarang air naik setinggi ini. Ini kali pertama,” katanya. Kejadian dipercayai akibat sistem perparitan tidak lancar. Bagaimanapun, air mula surut bermula jam 10 malam. Bersimpati dengan insiden terbabit, Menteri Muda Pelancongan yang juga ADUN Jepak Datuk Talib Zulpilip melawat ke kawasan kejadian pada malam tersebut. Beliau bersama Pandi dan Abu meninjau ke-adaan banjir di sekitar kampung tersebut. SIBU, Feb.14(Bernama) — Issues affecting the Chinese community in Sarawak have always been brought to the attention of the state government, Minister of Environment and Public Health Datuk Sri Wong Soon Koh said. “They are always brought to the government’s attention and not swept under the carpet as conveniently alleged by certain quarters,” he added at a United Chinese Association Chinese New Year gathering here last night. 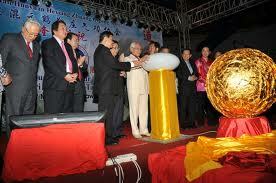 KUCHING: Chief Minister Pehin Sri Abdul Taib Mahmud said the Chinese have to think for themselves whether to have good representation in the Barisan Nasional (BN) government. He pointed out that it will be a “sad, sad” thing for himself to think of the possibility of not having good, sober and well-thinking Chinese leadership in BN. 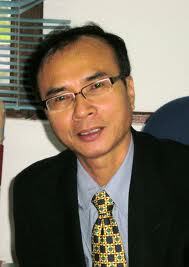 “The future for the Chinese in Malaysia is good, compared to other countries. “So for this reason, the Chinese community in the state must reflect on its fate by having a good representation in the BN government to ensure its communal requests and interests are heard,” Taib said. GONG XI FA CHAI: TYT dan isteri (tengah) serta Taib dan Ragad (dua kanan) memotong kek Tahun Baru Cina sambil disaksikan tetamu lain. SIBU: Ketua Menteri Pehin Sri Abdul Taib Mahmud menyarankan agar wakil rakyat dan pemimpin masyarakat di Sibu bijak memanipulasi pembangunan sedia bagi tujuan melonjakkan ekonomi dan aktiviti pembangunan di sini. Katanya, wakil rakyat serta pemimpin di sini juga harus membuka ruang bagi menjalinkan kerjasama dengan pemimpin lain di serata negeri dalam usaha mencanang lebih banyak aktiviti pembangunan. “Sekarang zaman telah berubah dan rakyat serta pemimpin mereka tidak boleh terlalu mengharap apa yang diusaha kerajaan. “Sebaliknya mereka (rakyat) perlu peka dan fokus untuk membangunkan taraf hidup dan sosioekonomi diri sendiri,” katanya. MUKAH: Pelaksanaan pelan induk untuk menambah baik pembangunan di Mukah, Tanjung Manis dan Samalaju akan bermula pada tahun depan, kata Ketua Menteri Pehin Sri Abdul Taib Mahmud. Menurut beliau, pelan induk yang holistik itu akan memperkasakan lagi potensi Koridor Tenaga Diperbaharui Sarawak (SCORE) selaku peneraju ekonomi bercorak baru negara. Anwar Ibrahim has made far too many mistakes in the two states. PETALING JAYA: No matter how one looks at the political situation in Sabah and Sarawak, PKR risks irrelevance there. Its continuing spin on Pakatan Rakyat’s agenda for change and reform will never work in the two states because it excludes the Borneo Agenda. 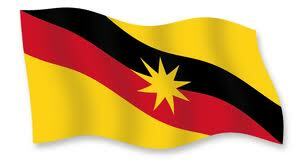 Sabah and Sarawak do not fit into the “Malay, Chinese, Indian” mould of Peninsular Malaysia. (Read “natives” for “Indians” for the two states.) Neither are the Sabah and Sarawak natives like the unfortunate Orang Asli of Peninsular Malaysia. They cannot be wished away from the political mainstream. Newly appointed Sabah PKR chief Pajudin Nordin’s departure from the party to sign up with Umno tells it all. Pajudin, in a harsh statement, expressed disappointment in de facto party chief Anwar Ibrahim and the latter’s wife and party president Dr Wan Azizah Wan Ismail. 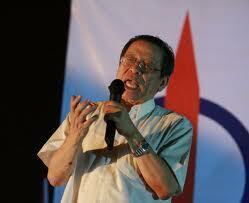 He accused Anwar, in particular, of “making fools of Sabahans” and “not serious” about handling issues in the state. 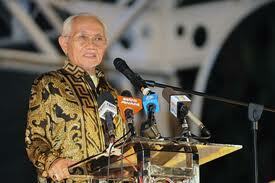 KUALA LUMPUR: Chief Minister Pehin Sri Abdul Taib Mahmud is inspired as to when to hold the impending state election. “He has got inspiration. He is inspired now,” Prime Minister Datuk Seri Najib Tun Razak told reporters after chairing the Barisan Nasional (BN) supreme council meeting at Menara Dato Onn, here, Friday night. 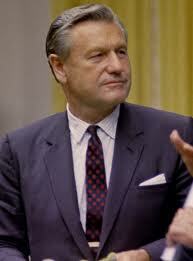 Obama's Envoy to Egypt Frank G. Wisner II is a member of a well known CIA family, son of one of America's most notorious spies, the late Frank Gardiner Wisner (1909- 1965), the mastermind behind the CIA sponsored coup which toppled the government of Mohammed Mossadegh in Iran in 1953. KENANGAN MANIS: Taib girang melihat potret lama yang diabadikan kepada beliau pada Program Sejiwa Senada di Lawas, semalam. Turut kelihatan (dari kiri) ialah Henry, Jabu, Ragad, Hasbi, Morshidi dan Awang Tengah. 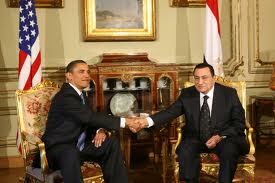 Egyptian president stands down and hands over power to the Supreme Council for the Armed Forces. Sarawak Chief Minister, Taib Mahmud has no time for Information, Communication and Culture Minister Rais Yatim, who advised Malaysians planning on marrying a foreign spouse, ‘to think a thousand times before taking the plunge’. And take the plunge he did, for Taib did not just marry a foreigner from Syria, Ragad Waleed Alkurdi, he married someone who was 45 years his junior. Taib is 74 years-old while his bride turned 29 on the day they held a wedding reception for the elite of Malaysian society. Last March, Rais said that studies conducted between 1995 and 1998 by “several sociologists in the country” had shown that seven out of ten mixed marriages ended in divorce. KUCHING: Barisan Nasional (BN) elected representatives must be proactive in bringing development projects to their respective constituencies. A file photo shows Egyptian students from Cairo University burn an Israeli flag. The uprising in the North African country is inspired by Tunisia's recent revolution that ended the 23-year-long rule of the country's President Zine El Abidin Ben Ali and sent him fleeing to Saudi Arabia. Israel fears that the ongoing popular uprising against Egyptian President Hosni Mubarak could threaten its natural gas supplies from the North African nation. Tan Sri Md Nor Md Yusof & Tan Sri Tony Fernandes smiling away! I was surprised to learn that you found my posting disgraceful. Regrettably the truth hurts! It was not true that AirAsia or Fly Asian Express Sdn Bhd aka FAX and now known as AirAsia X Sdn Bhd have been OPEN about the issues concerning RAS or any other issues concerning your AirAsia (AA) outfits. Initially, I was under the impression that the subsidy that FAX received from the Badawi’s Administration was only RM65 million and this figure has been quoted in my earlier postings and questions to MOT in Parliament. But you and your AA outfits have never uttered a word that the actual subsidy was almost RM250 millions and that AirAsia X Sdn Bhd had to give up RAS due to extremely poor service and too many complaints received from the Sabah and Sarawak State Governments and other authorities. It was not the previous Ministers of Transport namely, YB Datuk Chan Kong Choy and YB Datuk Ong Tee Keat but the current Minister of Transport, YB Datuk Kong Cho Ha through his Deputy that confirmed the subsidy granted was in fact almost RM250 millions and that the services provided by AirAsia X Sdn Bhd was not up to mark at all. Until now you or your AA outfits have not confirmed receiving the subsidy of almost RM250 millions from the Badawi’s Administration. But you have been quoted to have said that you have received very little help from the Badawi’s Administration and that you only got helps from Tun Dr Mahathir and the current PM, YAB Datuk Seri Najib. You have such a “Great” business model and have been making “HUGE” profits for years, then why you and/or your AA outfits had to rely so heavily on Government helps? It just boggled the minds of the rakyat! Whether you and/or your AA outfits are prepared to make public the details of the audited accounts of the RAS carried out by Fly Asian Express Sdn Bhd aka FAX, which was terminated prematurely? During Fly Asian Express Sdn Bhd aka FAX operations of Rural Air Services (RAS), how FAX cannibalised an aircraft for spare parts and 6 aircraft grounded due to un-airworthiness? Did FAX/AirAsia X Sdn Bhd pay MAS RM35 millions for the refurbishing costs incurred to make the aircraft airworthy again? Why was there any necessity for AirAsia Bhd to sub-contract the RAS to FAX? Why FAX had to dump RAS back to MAS in 2007? How he and/or Air Asia X Sdn Bhd persuaded Badawi’s Administration to grant Air Asia X Sdn Bhd the Air Operation Certificate (AOC) when it was just incorporated for only 2 months? Having charted bad poor records under RAS, how he and/or AirAsia X Sdn Bhd “persuaded” the Badawi’s Administration to keep its AOC when it should have been withdrawn because of such bad track record? Thereafter, how he and/or AirAsia X Sdn Bhd was awarded with 32 international routes like London, Paris, Gold Coast, Melbourne and etc by the Badawi’s Administration and to operate 13 routes which routes were in competition with MAS? Last but not least, how much did AirAsia Bhd or AirAsia X Sdn Bhd actually charged and received for RAS from the Badawi’s Administration, which Tan Sri Tony Fernandes has been quoted to have said that “AirAsia received little help from the Badawi’s Administration and to provide the detailed costing? Please take note that when I have more time to spare, I shall post more questions about your AA outfits especially AirAsia X Sdn Bhd formerly known as Fly Asian Express Sdn Bhd aka FAX and of course, the secret MAS – AirAsia share swap and the so-called “Collaborative Frameworks”. Just in case, you have not read the other postings in this Blog, your good friend, Tan Sri Azman Mokhtar, the MD of Khazanah Nasional Bhd, when asked about Khazanah’s option to purchase the 10% AirAsia X Sdn Bhd under the said secret share swap, he told the bloggers on 16-8-2011 at the Hilton Hotel that “it was a DODGY deal”. Despite his said respond, Tan Sri Azman Mokhtar instructed investment banker Stanley Morgan to carry out a valuation exercise on AirAsia X Sdn Bhd. What is your take on the said DODGY DEAL, Tan Sri? 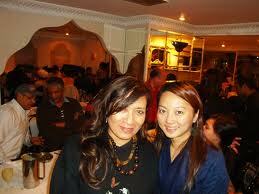 PKR Sabah is collapsing is PKR Sarawak next? While Sabah PKR grapples with its leadership issues, on the ground disillusioned members are pledging allegiance to someone else. ENTILIBON: Is Sabah PKR collapsing? It seems like it, at least as far as the “no impact” Kadazandusun Murut community is concerned.